1 Mix all ingredients except Oil for shallow frying. Use a little Water and knead soft pliable dough. 2 Divide dough into 9-10 balls and roll each into a 5" round. 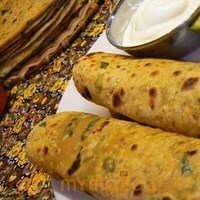 3 Sprinkle all all purpose flour over chapati while rolling, for ease. 4 Place on a hot griddle, roast and drizzle Oil, to shallow fry. 5 Repeat for other side. Repeat for remaining dough. 6 Serve hot with any sweet pickle or Curds. 7 Equally tasty when cold too.